Car & Driver recently put the Silverado up against the latest from Ford, RAM and Toyota in a four way competition designed to see which truck was the best. While the Silverado finished a close second to the F-150, upon closer inspection there are some additional reasons why the Silverado is the best pickup truck on the market. The Silverado equipped with the 6.2L V8 engine dominates the competition with the best maximum towing and payload of any mid-size truck. The Silverado has a max payload of 2050 lbs, 30 more than the Ford and a max towing capacity of 11,800 lbs, a healthy 300 more than Ford. 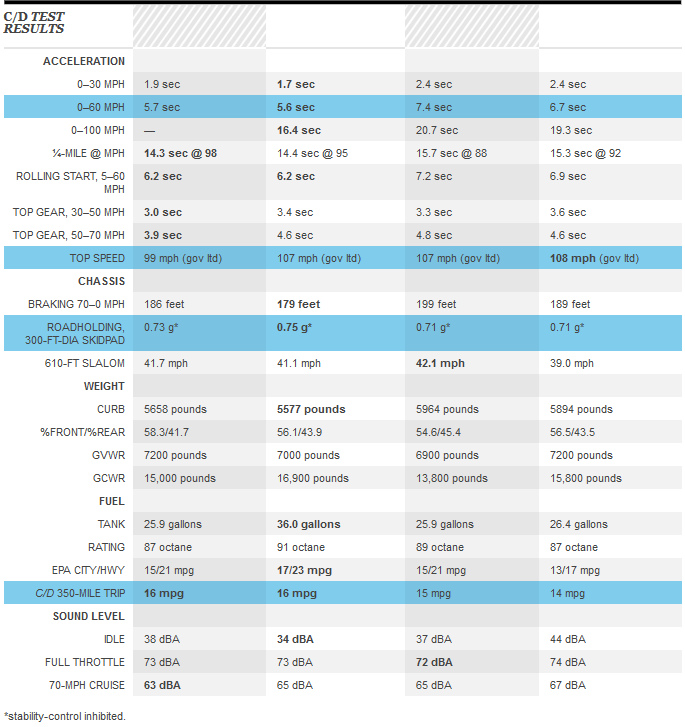 RAM and Toyota trail with max towing capacities of 10,160 and 9,800 lbs respectively. 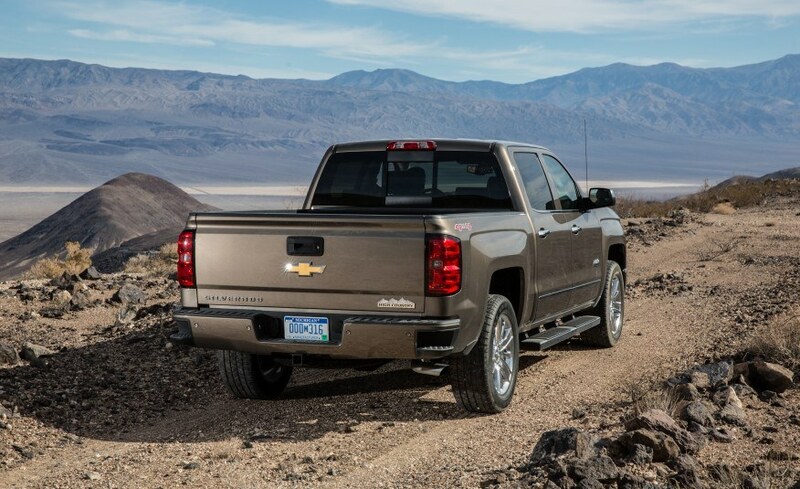 For those looking to get the job done, the Silverado is the clear winner. The interior of the Silverado was praised by Car and Driver as being “the world’s most comfortable.” Additionally, the testers found the infotainment system in the Chevrolet to be the “easiest to master.” Any journey in the Silverado will also be more enjoyable with the quietest interior of the bunch at cruising speed. It was 4 dBA quieter than the Toyota. Even with the best payload and towing capacities, the Silverado still delivered the best observed mileage of the test. Impressive when you consider it can still outperform the other trucks. Over the test, the Silverado and F-150 both returned an average of 16mpg besting both RAM and Toyota. Despite the potential fuel savings of an all aluminum body and turbo charged V6 engine, the F-150 still couldn’t beat the Silverado. 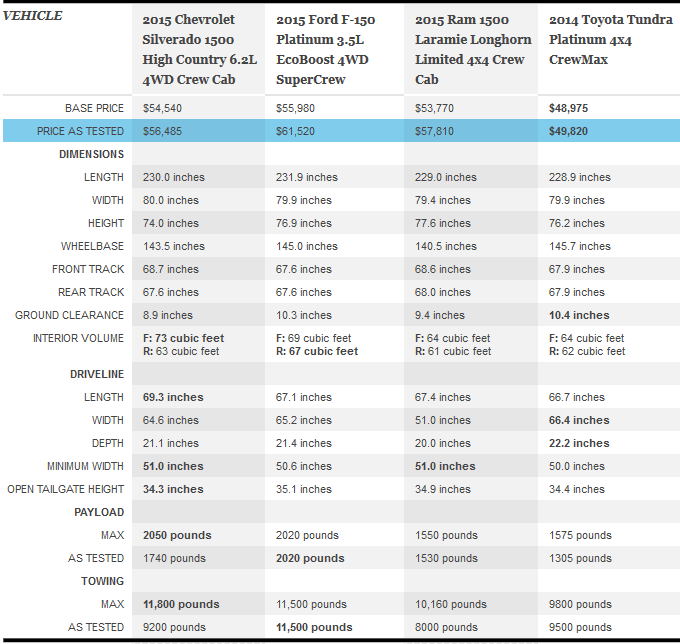 Each truck tested in this comparison was a top of the line model. The Silverado High Country had the second lowest Price as Tested and was over $5,000 cheaper than the Platinum level Ford. When you consider that Ford’s new aluminum body costs far more to repair than a traditional steel truck, the Silverado adds up to more money in your pocket! You want to be comfortable in the truck you are driving and the Silverado is one of the most sure and confident trucks on the road. 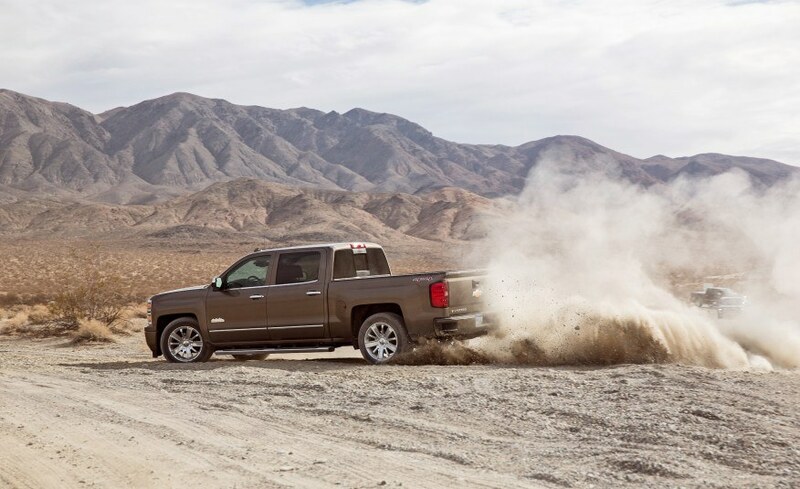 In both steering feel and handling, the Silverado bested the competition. The testers noted that the Chevy’s steering is “more responsive with better feedback.” Additionally, “there’s a direct, engaging feel… that’s missing from the other trucks.” The pickup trucks of the past have been difficult to control and provided little to no feedback to the driver while handling or cornering. This is not the case with the Silverado, which is confident and assured at every turn. Click here to see all Silverado inventory! Click here to schedule your test drive!